This post was first published in 2013. It was rewritten and republished on June 12, 2018. Digital footprint, digital shadow, online reputation, digital tattoo — whatever you call it, it’s a term that’s too important to ignore yet often isn’t discussed in homes or classrooms. One’s unique set of traceable digital activities, actions, contributions and communications that are manifested on the Internet or on digital devices. 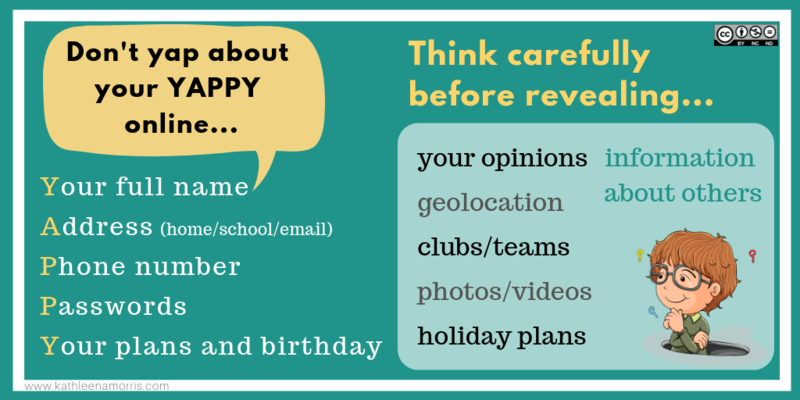 This post looks at how we can teach kids about digital footprints and breaks down the key points. There are lesson and activity ideas. 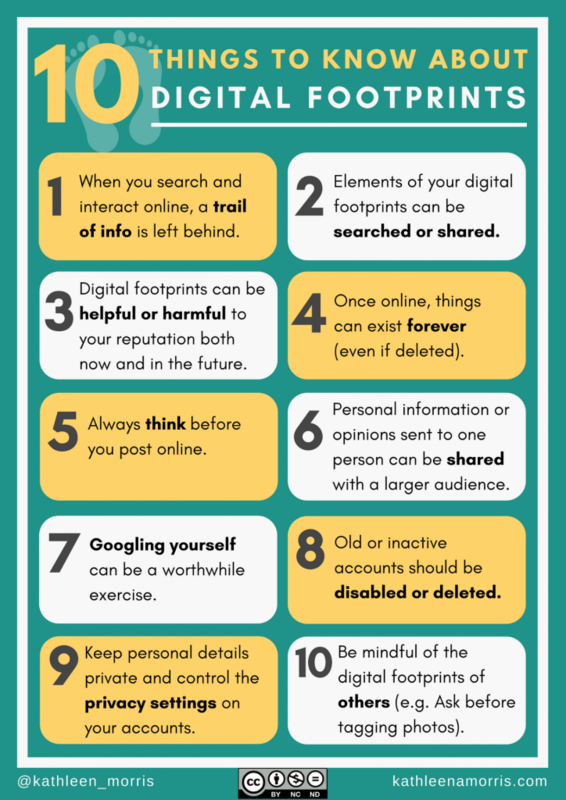 You can also find 10 important things to know about digital footprints summarised in a poster further down. Traditionally, digital footprint resources tended to focus on the negatives and promoted a culture of fear. This isn’t helpful. Our students are generally heavy internet users and scare tactics are unlikely to make them want to disconnect completely. Nor would we want them to. While we can’t be complacent, the message I like to promote is that we should protect and shape our digital footprints, and try to ensure they’re positive. Encouraging students to avoid posting or doing anything online is not the answer. When you write the story of your life, don’t let anyone else hold the pen. When it comes to digital footprints we have some control. Digital footprints are sometimes defined as active and passive. It’s important to remember that despite aiming to “hold the pen” and write our own story, this is not always going to be possible. Images can be altered. Data is stored and accessed without our knowledge. Words can be misquoted. Intentions can be misread. Personal interactions can be shared. Individuals can be tagged without permission. We can’t assume we always have control. I can see a day in the not too distant future … where your ‘digital footprint’ will carry far more weight than anything you might include in a resume or CV. Has that day come? Probably. But some people might not realise it. Reports of colleges or employers relying on Google searches to help make judgements about applicants are nothing new. But maybe where the search used to focus on character judgements, there is now an additional expectation that a portfolio of work will be available? Surely an archive of online work is going to begin carrying more weight than an outdated qualification or random personal reference? One certainty is that young people need guidance navigating the online world, just like the offline world. Because of their age and limited life experience, it can be difficult for students to consider if what they’re happy to post online now is something they’ll still be happy with in 1/5/10/20 years. There are certain things you can teach students to definitely avoid sharing online. One acronym I’ve always liked using is YAPPY (Your full name, Address, Phone number, Passwords, Your plans and birthday). There are many grey areas beyond YAPPY though — sharing opinions, sharing information about others, deciding if content you create should have a public audience… the list goes on. Experience and conversation can be vital. Feel free to use the above visual on your blog if it would be helpful. Just link back to my site! Beyond Students: What are Teachers and Parents Doing? Have you ever cringed seeing a fellow teacher post a questionable photo or loaded opinion on social media? I have. Perhaps underestimating the importance of digital footprints is still a widespread problem. Another scenario that I still believe is common is teachers not having a digital footprint at all. These issues are worrisome to me when thinking about the need for educators to be role models. Nowadays, an individual’s digital footprint often starts being created before they are even born. Perhaps with a pregnancy announcement on social media followed by all sorts of childhood “firsts” broadcast for an online audience. What are the consequences of this? We can’t know for sure, but maybe more education, discussion, and awareness of digital footprints is required within the wider community. Can our students assist with this task? Digital footprints comes under the umbrella of digital citizenship. This used to be called cyber safety or internet safety, but the definition has broadened. 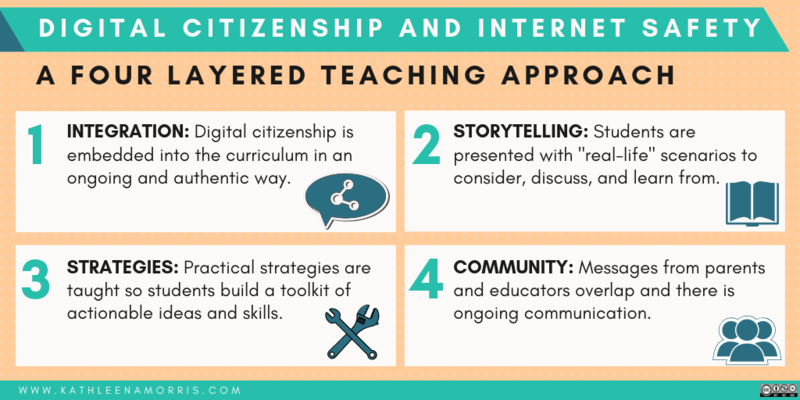 In Teaching Digital Citizenship: 10 Internet Safety Tips for Students, I suggested a four layered approach to covering digital citizenship. The same approach could be useful for digital footprint education. INTEGRATION: Digital footprint education should be embedded into the curriculum in an ongoing and authentic way (e.g. 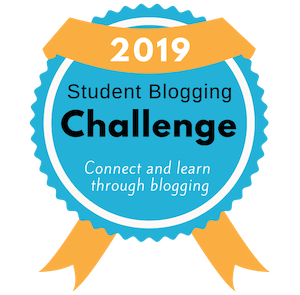 through a classroom blogging program). STORYTELLING: Students should be presented with “real-life” scenarios to consider, discuss, and learn from. STRATEGIES: Practical strategies should be taught so students build a toolkit of actionable ideas and skills. COMMUNITY: Messages from parents and educators should overlap and there should be ongoing communication. Read more about this model. Conversations around digital footprints should be on the agenda from an early age and this is a topic for the whole community. The work of one teacher is not enough. I’ve summarised these key points in a poster below which you’re welcome to use in your classroom. When you visit websites, search, and interact online, a trail of information is left behind. Elements of your digital footprints can be searched or shared. Digital footprints can be helpful or harmful to reputations both now and in the future. Once online, things can exist forever (even if deleted). You should always think before you post online. Personal information or opinions sent to one person can be shared with a larger audience. Googling yourself can be a good habit to get into (or try a search engine like Pipl). Old or inactive accounts should be disabled or deleted. You should keep certain personal details private and you can control the privacy settings on many of your online accounts. We need to be mindful of the digital footprints of others too (e.g. Ask before tagging others in photos). Check out this great video by Common Craft. The simple explanation makes it clear to students that everything they do online leaves a trail, and this is something they should be cautious of. It also reminds students what they can do to take control of their digital footprint. This short video from the eSafety Office could be a good classroom discussion starter for older students. Digital reputation | What comes up when you Google yourself? Young people are naturally wired to take risks. In the pre-internet days it was easier. Sharing of personal details was often confined to letters, diaries, or phones calls, not a global audience. Some risks were less consequential. We want our students to continue to be curious creators who enjoy connecting with the world in purposeful ways. Let’s help guide them to build a positive digital footprint as they do just that. You never know what amazing opportunities could come of it. Do you have any thoughts on teaching about digital footprints? Please leave a comment and share your advice or resources! The Common Sense materials are great, aren’t they! This year I signed my class up for the Digital Passport by Common Sense Media. It is a series of lessons you can work at to your own pace but approximately 4 hours total. We started in school. Many students opted to continue at home. We thought it excellent. I only discovered the Common Sense materials this year and I’m glad I did. The Digital Passport resource sounds great. I will check it out now. Thanks for the tip! Great article about how having a positive, encouraging, and present digital footprint will help our young people. I think the time has come where the resume is less important and a twitter feed and interactions on it is more important to prospective employers. Teenagers think “Employers won’t look at my facebook status updates and twitter feed from when I was a teenager.” I think that couldn’t be further from the truth. Teaching our young people to make their words, actions, and photos consistent between their online life and their real life is what is most important. Helping young people create a positive, uplifting digital footprint now so that when someone goes looking for them online, and someone will, what is found is worthwhile and positive. Those are excellent thoughts. Even though my students are in grade four, they were very surprised when I told them someone might be looking at their digital footprints from now when they are trying to get a job in the future! This is definitely something that needs to be discussed more often. Totally great, well thought out post- am drawing together something for parents on this topic and this has really helped. Thank you! Awesome blog post! It is so important that we find the time to educate our students about digital citizenship. Too many times students don’t realize the importance of the digital footprint that they are building right now. We need to educate and help them build their brand on a solid foundation. I love teaching digital citizenship to our students and am glad that we are doing it K-12. Always a pleasure reading your material Kathleen! Keep up the great work! I agree that too many students (and adults) don’t realise the importance of digital footprints. Sounds like you’re doing a great job educating your students in this area! Hi. What a thought provoking post. 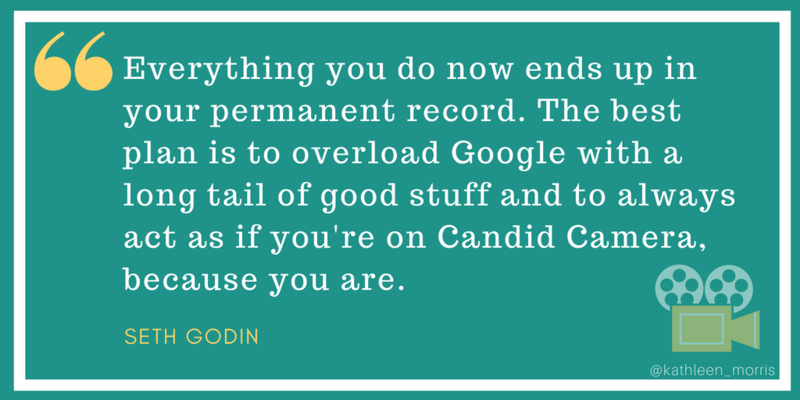 I really like the Seth Godin quote. I will be sharing it with my 5/6s. I’ll also be checking out your suggested resources. I like that Seth Godin quote too. Even though it is 5 years old, it still rings true! Thanks for reminding me about eBuddies. I will have to revisit it as I remember hearing about it and never used it. Where can I find that eBuddies resource? It sounds great and we are currently working through the eSmart Schools Framework. Just having trouble locating it. Great point about digital footprints being a positive means to extend your reputation. So much of what we hear focuses on the inherent dangers and privacy issues around a digital presence online. Although important, we need to balance this and help kids and teachers learn that a digital footprint can be a positive. This might also help address the worrying issue of people totally avoiding leaving a digital footprint out of fear. We need to help people realise that the Internet is not going away; it’s a part of life and putting your head in the sand long term and failing to address the issue does far more harm long term. It really is a worrying issue that people don’t create a digital footprint. I think it’s either fear, or lack of understanding that an online presence is important. Hopefully this message will spread! Kathleen, this is a wonderful post on a topic I’m very interested in and wish all educators were invested in. I think letting kids know that social media background checks up to 7 years in the past are legal (http://internet-safety.yoursphere.com/2011/07/the-social-media-background-check/) is one way to encourage them to let their digital footprints work for them instead of against them. I’ve posted a few thoughts on this topic, including ideas that can be used with teachers and students. Links are below. Thank you again for posting on this important topic! I’ve added your post to my Digital Citizenship collections on ScoopIt and Pinterest. 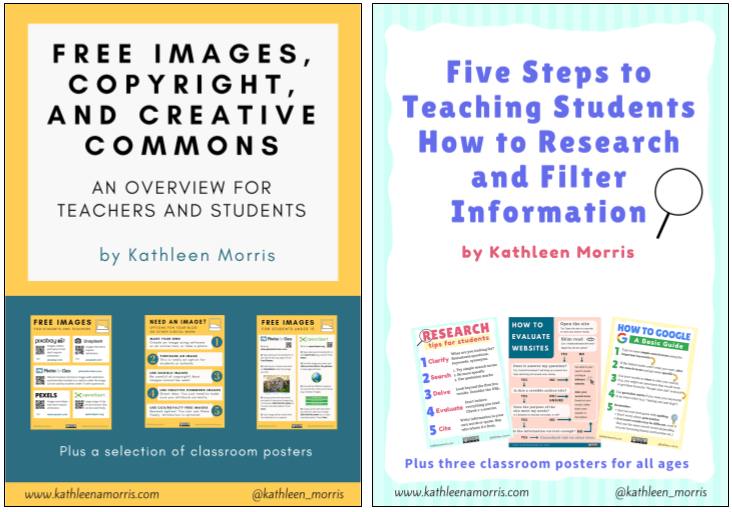 Thanks so much for your wonderful comment with so many fabulous links and resources! That really is a fabulous comment by Will Richardson. I find his work so inspiring. I read the article about legal social media checks with interest. I assuming this article is American so am wondering what the legalities would be here in Australia? I look forward to adding all your links to my Diigo! Kathleen, I’m glad you like the links I posted. Sorry I didn’t clarify on the background check article being from the U.S. I, too, wonder what the rules/laws are in different countries. I think it’s important to know those laws, but to also realize that people who want to know more about you are going to Google you whether they are supposed to or not. Here’s to continuing to educate everyone on making their digital footprint work for them and not against them! Nice written article. This to me is not just about kids. Thanks for reminding me to keep a positive digital footprint. It presents digital footprint as it is vs. bad or good. The material is becoming a little dated, but the students do not notice it. Works as a great conversation starter. Thanks for the link to the YouTube video. Looks like a good conversation starter. Perhaps the creator might even update it soon. That would be good. Thanks for sharing this, Kathleen. They aren’t always looking for something negative. Quite often they are hoping to find something great like an art student’s portfolio or a blog or something tangible that showcases great work/potential. Thanks for sharing this article about digital footprints/personality. It’s great to see something positive and to have a real life example! Great article! I devoted an entire book to this subject: Digital Leader. It reviews the pitfalls of today’s digital world, but primarily focuses on 5 keys to creating a positive Digital Legacy. Digital Legacy = Digital Footprints + Digital Shadows. Note that your digital legacy is used today as well as 300 years from now. Digital Footprints are what you upload about yourself, whereas Digital Shadows are what others upload about you. Together they are your imprint on this world, so use them to get hired vs. fired. Thanks for the great post as it’s a subject near and dear to my heart. The book has already been translated into Spanish and Chinese. Thanks for the information about your book – sounds like an interesting read. I am completing my final year of BEd Primary through USQ. As part of our assessment we are to curate a publicly accessible collection of online resources relevant to the classroom implementation of technology education in the Australian context. This project is also intended to support me in achieving active personal/professional learning networks (PLN) and establishing a positive professional presence on the World Wide Web. This activity will also establish my own positive Digital Footprint as a future educator. It was suggested that the establishment of a blog was an effective method for curating and sharing this collection of resources. For my first blogging experience I elected to use edublogs, which I am steadily learning to navigate. I found your blog on Digital Footprints very informative, as this topic was raised by the lecturer in the first week of the semester. I believe it is a topic which should be discussed with students so they know about and understand the positive and negative impacts of their own Digital Footprints. As you indicated most are not aware of what a Digital Footprint may be prior to discussing the topic with them. Thanks for referencing my article! I’m so glad to hear you’re talking about digital footprints at uni. Sounds like a great course. Thanks for writing about the importance of leaving a positive digital trail. I used to be reluctant to step out in this digital world because of all the attention to the negative side of it. Having come into the education field now, I realize the scope of this territory and also how much kids are engaged in this world. The permanency nature of this trail is hard for many kids (sometimes, even for adults) to grasp and remember at all times. But, educating them can definitely help. Thanks for sharing all these resource here! So great that you’re no longer reluctant and realise the scope that technology offers. 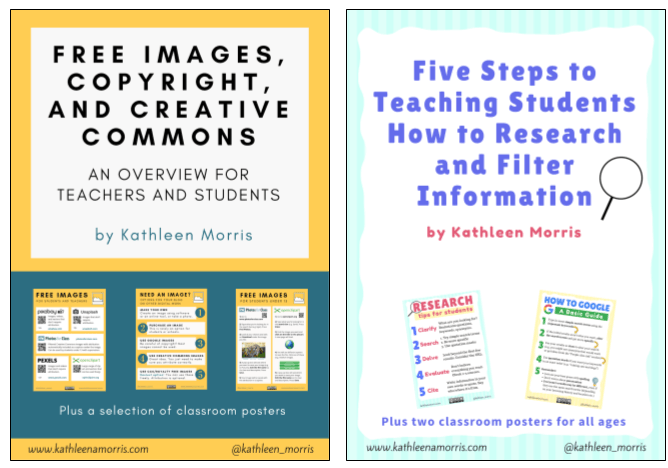 I hope the resources help in your classroom! I want to commend you for you committment to having a dialogue with parents and educating them as well. I have just started a website in my classroom and am still learning as I go. Eventually, thanks to reading your post, I think creating blog opportunities to parents will be useful. I didn’t realize that even in the impoverished community I teach, most of them have computers and have been letting their child go onto our website bergstrojans.com and have been active in allowing their children to benefit at home from the site. Keep it up and know that you are an inspiration to teaching. You’re right that it’s very common to have tech access these days. From my observations it doesn’t seem to be limited by financial situations anywhere near as much as it used to be. Thanks for taking the time to comment on our class blog too! Thanks for a great blog post. 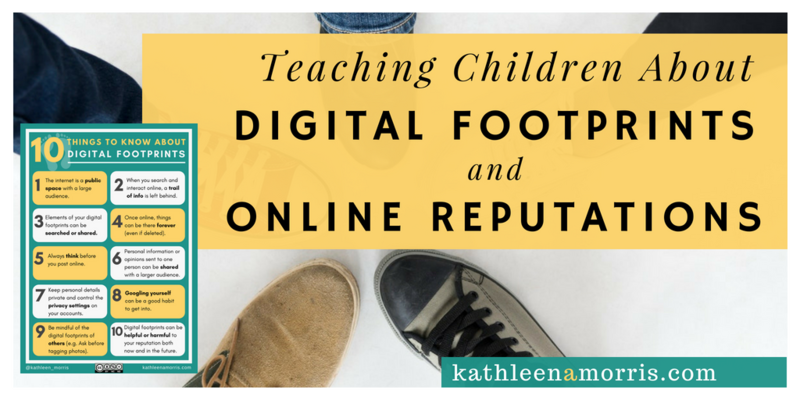 In the three years I’ve been in the role of teacher librarian/information literacy specialist at a primary school in Melbourne, I’ve changed my approach when helping kids to uncover the idea of what a digital footprint is. I’m happy to say that I’m now approaching it from a positive point of view, as you mention. I love CommonSense Media-such a treasure trove of information! As one teacher said, just get in their car and drive. Your librarian/info literacy specialist role sounds fabulous! I wish all schools had someone like that. 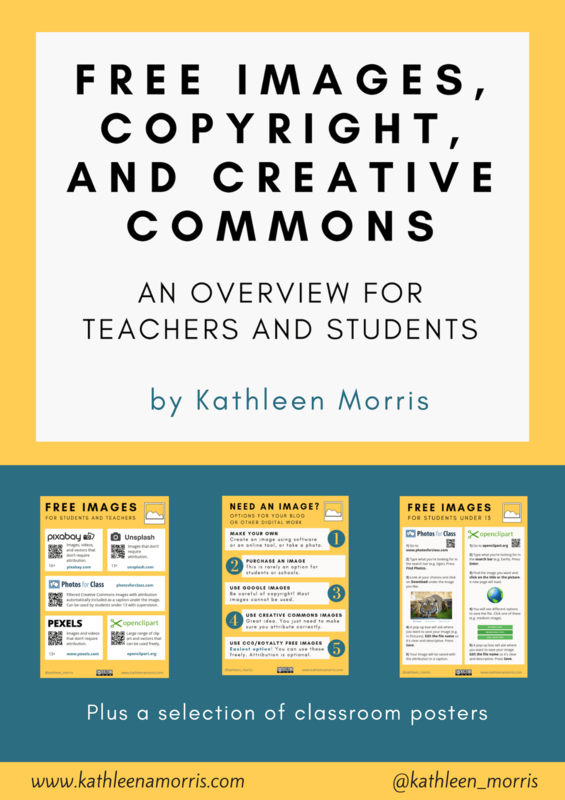 CommonSense Media really does have some great resources – I’m so happy I discovered it, like you. Thank you so much for the resources! Instead of focusing on the negative aspects of a “digital footprint” I really want to focus on the positive aspects as I help my students set up their blogs next year. My students will be all over Common Sense Media’s Trillion Dollar Footprint exercise. Great thoughts. Thanks!! Glad you found the resources useful. Thanks so much for letting me know! I think that the concept discussed here is one of so much value. I am currently working on iPads with preschool children and they are so incredibly aware of how to use them already. I open an app and they are shouting out the names of some of their favorites. If technology is as prevalent as it already is and will continue to be in their lives, I think the importance of teaching children the benefits as well as draw backs is so important. Children are frequently warned about the dangers but like you said, this can also be viewed in a positive light. We should be taking this immense knowledge that the children have and the strong interest that they take in such technologies and fostering it into creating something positive. It is definitely important to leave our mark and with their knowledge at such a young age, they can do such amazing things as long as they have the proper precautions. I think this is a great article. I also thought of the words “digital footprint” as only being negative, but the article makes some great points about leaving a positive reminder behind about yourself. The net is a scary place and care must be given to what you post. And if you are positive and post that which helps and uplifts we have a chance to change the web envirment.